Alexis Sanchez is ever closer to a move to Manchester United if the events of social media are to be followed. The player who has dominated headlines in recent days as he nears a move to Manchester United liked an Instagram farewell post by popular Arsenal fan, Troopz. The 29-year-old trained with Arsenal on Friday and could make his final appearance for The Gunners in the clash against Crystal Palace. Troopz had been a fierce critic of the player, as he has claimed on Arsenal Fans TV that the club should cash in on the player. 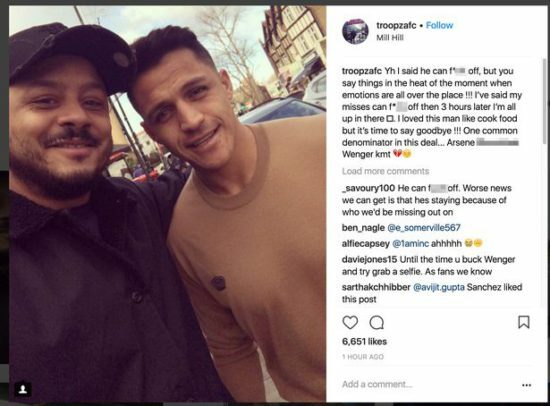 However, Troopz posted a photo on Instagram of himself and Sanchez, thanking the player for his service to the 13-time English champions. Sanchez liked the post, leading to the submission that his time at The Emirates is almost over. He had refused to sign a contract extension at The Emirates, as he could not be convinced to stay at the club due to the fact that he wanted more money. He was also worried about the lack of ambition the club were showing, and things came to a head following the 10-2 defeat to Bayern Munich in the Champions League last season. He is expected to sign a £490k-a-week deal at Manchester United, which would see him become the third highest-paid player in the world. Henrikh Mkhitaryan gave a tearful exit to his Manchester United teammates at the club’s training ground, which means that he is moving ever closer to joining Arsenal, a fact that would mean Sanchez’s arrival is imminent at Old Trafford. He will wear the number 7 jersey at United, joining an illustrious list of players to have worn that famous number for the 3-time Champions League winners.